What is so special about oscillators? Our exploration into molecular excitation begins with a description of simple harmonic oscillators. A simple harmonic oscillator displays a very particular type of periodic motion called simple harmonic motion. A common example of a simple harmonic oscillator is a spring that oscillates between a stretched and compressed position. Physicists often use springs as a model to help explain complicated systems like the motion of fluids or the behaviour of atoms in a bond. Simple harmonic motion is useful for starting to understand concepts in quantum chemistry. More complicated descriptions of atomic bonds will be addressed later. An example of an everyday harmonic oscillator is a spring. A spring at rest, meaning it is neither compressed nor stretched, is said to be at its equilibrium position. A spring will resist being moved from this position because it is currently at its lowest energy configuration. When the spring is stretched or compressed from its equilibrium position, the spring increases in its potential energy. In the diagram below, x represents the distance the spring is from its equilibrium position. Try stretching and compressing the spring to the left. Observe the relationship between the distance from the springs equilibrium position and changes to its potential energy. What else do you notice? What happens to the motion over time? Try stretching the spring as far to the right as possible. What happens? This topic is not currently available. Physical chemistry attempts to understand chemistry through the physical world and using instrumentation. 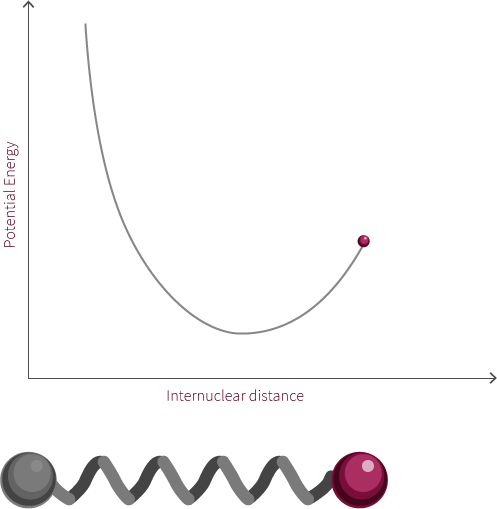 Molecular excitation refers to the promotion of an electron to an excited state. This particular pheomenon is extremely important for current scientific discovery, particularly in the biological sciences. A simple harmonic oscillator displays a very particular type of periodic motion called simple harmonic motion. A common example of a simple harmonic oscillator is a spring that is compressed or stretched. 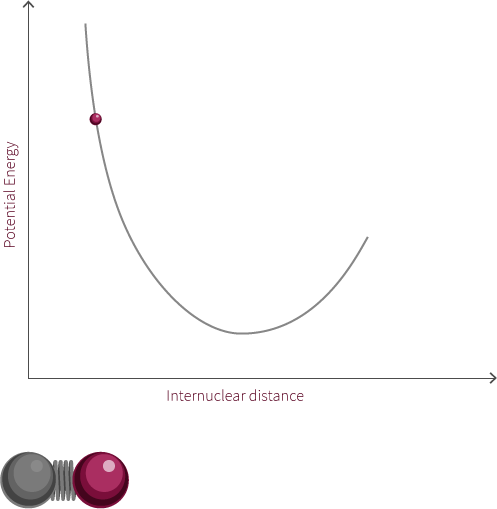 Morse potentials are used to model the interaction between two atoms in a diatomic molecule. A diatomic molecule has only two atoms which are connected through a chemical bond. This particular diatomic molecule is double bonded. 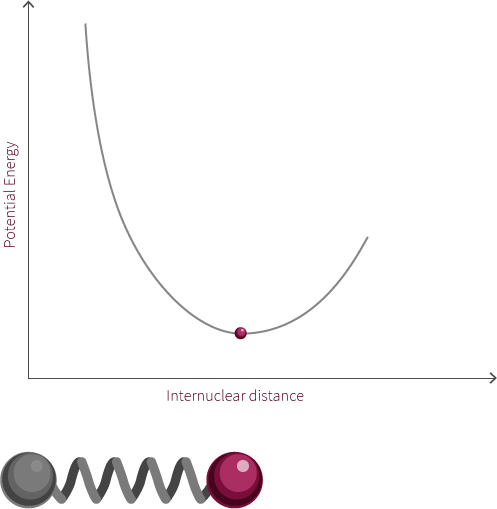 The energy of a diatomic molecule can be approximated using a Morse Potential. Quantum effects are not discussed. The vibrational state of the diatomic molecule refers to the frequency at which the atoms oscillate (ie. the bond stretches and compresses). A single rotational mode is available to the diatomic molecule and involves rotation around an axis that is perpendicular to the bond axis. The energy of the rotational mode is directly related to its angular momentum. Electromagnetic radiation is a form of that travels in waves. Specifically, electromagnetic energy travels in a transverse wave that oscillates at a certain frequency. Like other dipoles, the transition dipole refers to a difference in charge from one location of a molecule to another. 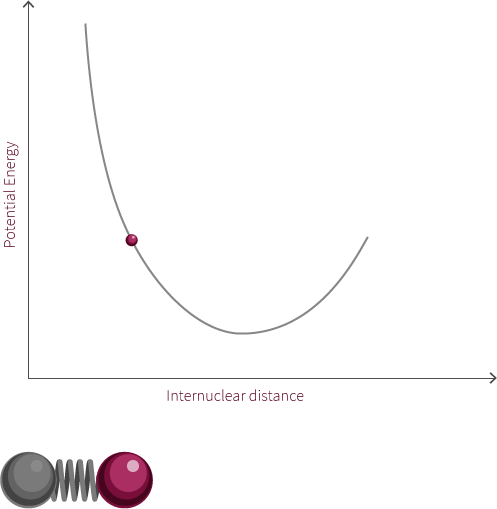 The transition dipole occurs when an electron is excited from the ground state to an excited state. The Jablonski diagram is capable of showing the transition between ground states and excited states by using quantized Morse potentials. Fluorescence begins with absorption and molecular excitation into an excited state. Once promoted, the electron will fall to the lowest vibrational energy within that excited state. which of these graphs shows the system at its lowest energy?